On the lead up to the upcoming Red Bull Cliff Diving World Series – Season 11 kick-off in El Nido, Palawan, World Series Champions Rhiannan Iffland (AUS) and Gary Hunt (GBR) have embarked on a cliff diving safari in South Africa. 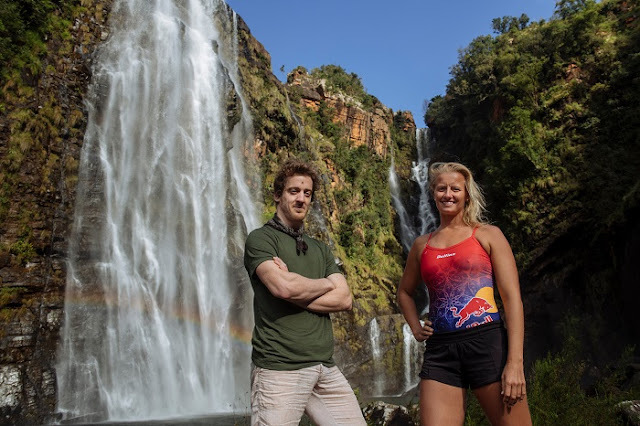 The record-breaking duo, Iffland and Hunt, scouted a number of locations that included majestic cataract falls and what is regarded as the greenest canyon on Earth at the Drakensberg escarpment in eastern Mpumalanga, South Africa. 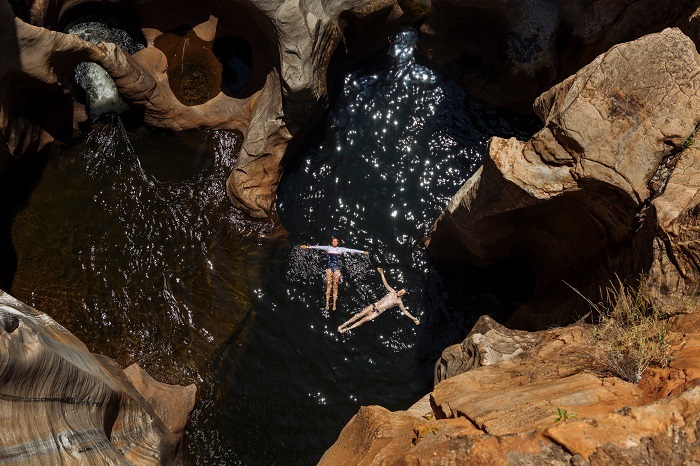 Iffland and Hunt found themselves particularly taken by Bourke’s Luck Potholes as an untouched diving spot. South Africa’s Mpumalanga province is decorated with numerous waterfalls that include the Lisbon and Berlin Falls. The glorious sight of the jade-coloured water basins and cylindrical rock sculptures in Bourke’s Luck Potholes inspired cliff diving’s most decorated athletes to execute free-falls of up to 27m at speeds in excess of 85km/h before the season opener in the Philippines. For laid-back Rhiannan Iffland, the goal is to be more consistent and build bigger dives all through the season, while enjoying every adventure that comes along the way. The safari through South Africa was everything Rhiannan Iffland and Gary Hunt needed in order to recharge their senses for the World Series’ 11th season. 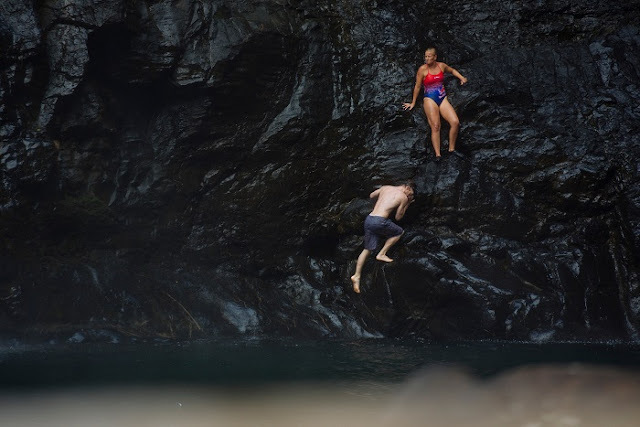 From diving into the fresh, jade waters of Bourke’s Luck Potholes to tossing coins over their shoulders into the canyon to leave bad luck behind, the champions are more than ready to kick-off the 2019 World Series in El Nido, Palawan! Catch the live broadcast from El Nido on Red Bull TV, Facebook and Youtube on April 13th, 2019.  Viewers in the Philippines may also watch the full event, along with the remaining six stops of the 2019 World Series, on S+A and iWant Sports (iwant.ph), 5PLUS and 5plus.com.ph, FOX Sports, FOX Sports GO, FOX+ app, online at http://www.foxsports.ph and on iFlix VOD service. We also invite you to follow the World Series on Facebook (win.gs/cliffdivingelnido), Instagram (@redbullcliffdiving) and Twitter (@cliffdiving).